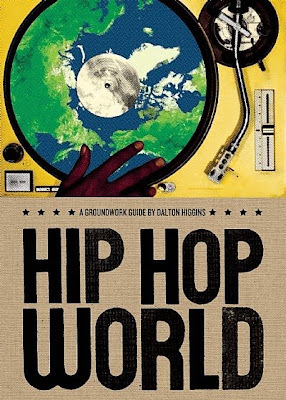 Hip Hop World: A Groundwork Guide brings mixed feelings to the table. On the one hand, Dalton’s own music background segues into a unique inside perspective that is by no means biased. Dalton’s writing keeps the book alive every step of the way by crafting genuine words and pushing historical points along. Dalton himself is perhaps the book’s brightest point as the author is one of the best voices in non-fiction music based books since Chuck Klostermann. However, the actual points of the book seem superficial. In certain respects, the book seems more like a glancing perspective of a powerful movement. While Dalton’s own voice emphasizes the strength and power of the hip hop movement, the words themselves downplay it. When speaking of the role of the Beastie Boys, for example, the reader can’t ever get their mind set as to whether Dalton is being critical or supportive to their role. As a casual fan of more underground hip-hop (I could never get into the Beastie Boys, in other words), I like to think I have some knowledge of hip-hop. However, at times I found Dalton’s narrative almost insulting to the little knowledge I had. However, the book is brilliant at educating the reader. This reader may have been a bit biased regarding the book’s subject matter but it is a great primer to the world of hip hop and highlights many of the elements many reader’s might not know of, such as the powerful island roots of hip hop and the spoken word heroes that gave much to the genre. As a reader, my expectations of the book were rather weighty. I expected a deep view of hip hop that would be mind altering. The book was by no means that. However, it was enjoyable, digestible (small enough that even those who hate non-fiction can read it) and informative.